Have you looked in the mirror recently and been dissatisfied with what you see? “When did those wrinkles develop? Didn’t my jawline used to be more pronounced?” The aging process, while slow, can take us all by surprise, and for most people, the prevailing feeling is, “I am too young to look this old.” The notion of facial surgery to reverse aging can seem foreign because you couldn’t possibly need a facelift already, but this procedure can help correct any issues that may be present and bolster your self-confidence. The secret is that there is no “right” age for a facelift. You don’t suddenly turn 65 and a lifetime of aging catches up with you. Instead, you should consider facial surgery based on your needs and aesthetic desires, not the years on a calendar. If there is no “best” age for a facelift, then when should you consider one? That depends on several factors. The rate and expression of aging vary between people and genders and is based on genetics, environmental elements, and lifestyle factors. While you can’t control genetics, like being more prone to jawline laxity than others, many controllable external factors can speed up the aging process. 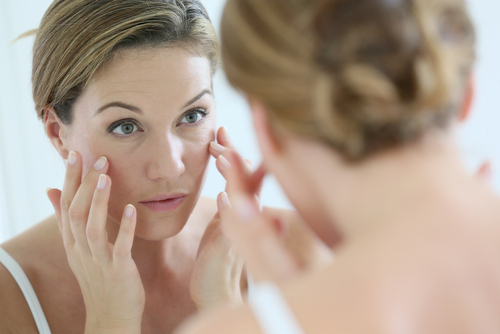 In a broad sense, facelift surgery will address signs of aging, such as skin laxity, in the lower face. Both wrinkles along the lower face and a drooping jawline can be improved with facelift surgery. For many people, this aged appearance results from laxity of both the muscles and skin. Vertical facelift: Lifting the tissues of the face vertically, rather than horizontally, produces natural-looking rejuvenation. Dr. Calabria executes all of his facelift procedures with this technique to avoid the dreaded “windswept” look of the traditional approach. Adjustable facelift: Because the face will inevitably continue to age even after cosmetic surgery, some facelift patients may want a secondary procedure in the future. The adjustable facelift offers patients the option for an easier and less invasive follow-up procedure to maintain their results. Stem cell-enhanced facelift: A traditional facelift does not address facial volume loss, which can lead to hollowed features. This technique involves extracting regenerative stem cells from unwanted body fat and injecting them into recessed areas during the facelift process. Suspenders facelift: During a facelift procedure, stress is placed on the incisions, which can sometimes lead to displeasing hypertrophic scarring. This technique alleviates some of the tension with the help of suspenders created from the patient’s facial tissue. Facelift surgery is one of the more common plastic surgery techniques known. It’s what comes to mind when we think of correcting facial aging. However, facelift surgery only addresses a specific area of the mid and lower face. Wrinkles and laxity around the eyes, brows, or neck can all contribute to an older appearance and cannot be addressed with a facelift. These issues require different types of correction, from surgical to nonsurgical. Blepharoplasty: A procedure that revitalizes the eyes and restores a youthful aesthetic by removing excess eyelid tissue and repositioning fat. Brow lift: A surgical technique that involves raising sagging eyebrows for a smoother and more inviting facial appearance. Facial fillers: A nonsurgical approach to facial rejuvenation and contouring that involves injecting high-quality dermal fillers into recessed areas of the face. They can also be used to fill in wrinkles to create a smoother surface. Laser skin resurfacing: Minimizes sun damage and signs of aging, resulting in an even skin tone and texture. Facial cosmetic surgery is versatile and can be tailored to address multiple concerns and deliver the results you desire. Before trying to self-diagnose the best technique for you, consult a board-certified facial plastic surgeon. You may not think you are old enough to need facial surgery, but nobody is ever too young to look their best. 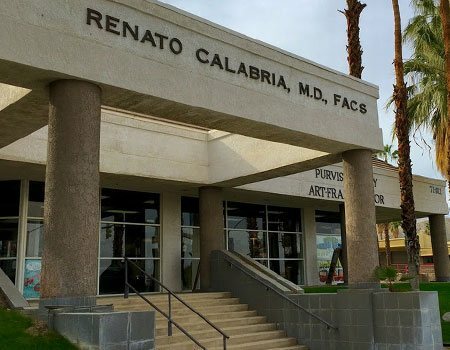 Dr. Calabria is a board-certified facial plastic surgeon serving the Southern California area. To schedule a facial consultation, please contact our office by calling 760.836.0077.